Supporters of Bernie Sanders rallied and marched around Oakland’s Lake Merritt today. Here are a few interviews that Oakland Socialist did with a few of them. More are coming. 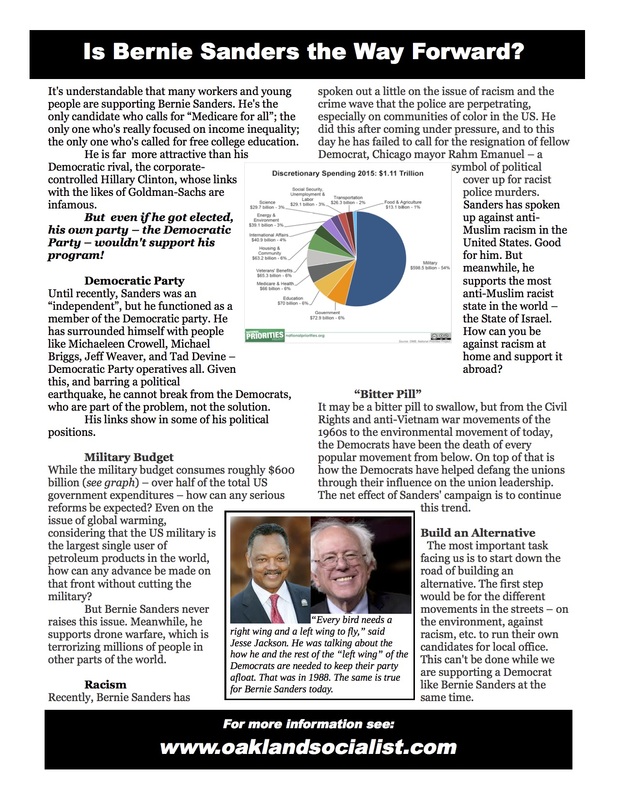 For those wanting to know more about a socialist view of the Sanders campaign, we urge you to check out this link. Your comments and/or questions are welcome. The last young women were being quite thoughtful, and they are to be commended for thinking about these things. We need to tell these activists the bitter truth, rather than promote illusions. Such “independent candidates” would end up being dependent on the same layer of sold-out trade union bureaucrats, non-profits and liberal institutions that Bernie is dependent on. One example of this, from here in Seattle, is Kshama Sawant and “Socialist Alternative”, which are widely promoted as “independent” and “socialist”, just like Bernie Sanders, whom they support to the hilt. As activists gain experience in various fights for partial demands, they learn that there are many treacherous “professionals” who work to hijack independent movements and drain their energy. We need to break from the influence of this layer of reformist professionals and the methods they use and the social-democratic thinking that they promote. The society we live in promotes all kinds of reformist illusions. We need to oppose these illusions, not promote them. We need politics that are genuinely independent, not independent-in-name only. Eventually the working class and oppressed will have their own independent organizations. These organizations may eventually run in elections, for various valid reasons. But these genuinely independent organizations can *never* be created if they are built mainly for the purpose of participating in (and winning in) the fraudulent capitalist election circus. Rather, the independent organizations we need will be created in independent struggles for partial demands, and in the struggle to bring to millions of workers and oppressed the need to overthrow the rule of capital and run society themselves.